The Mediator core (blue) associates with either Pol II (green) or the CDK8 module (grey). Davis, et al., have shown that Fbw7 (purple) regulates the interaction of Mediator core with the CDK8 module by targeting the CDK8 component MED13 for ubiquitylation and degradation. Mediator is an evolutionarily conserved complex of proteins that physically links transcription factors with Pol II to regulate transcription initiation and elongation. Mediator is generally found in two forms based on the presence or absence of a 4 subunit regulatory module called the Cdk8 module. While the Cdk8 module has both positive and negative roles in transcription regulation, it is unclear how the Mediator-CDK8 module association is governed. In a recent report published in Genes & Development, Drs. Michael A. Davis and Bruce E. Clurman (Human Biology and Clinical Research Divisions) demonstrated that the tumor suppressor Fbw7 plays a key role in modulating the interaction between Mediator and the Cdk8 module. Fbw7 is the targeting component of a Skp-Cullin-F-box (SCF) ubiquitin ligase that regulates the proteasomal degradation of several transcription factors implicated in oncogenesis (including Myc, Notch, and Jun) and substrates are recognized through a conserved phosphodegron (CPD). To identify novel Fbw7 substrates, the team employed affinity purification and mass spectrometry, with the hope of better understanding the roles of Fbw7 loss in tumorigenesis. They identified 72 proteins that immunoprecipitated with wild type Fbw7, but not an Fbw7 mutant incapable of binding substrates. Intriguingly, 26 of these proteins are components of the Mediator complex. Two of the identified Mediator proteins, MED13 and its paralogue MED13L, contain optimal CPDs, suggesting they might be Fbw7 substrates. Supporting this hypothesis, MED13/13L only immunoprecipitate with Fbw7 in the presence of a proteasome inhibitor. Similarly, mutating a single amino acid within the CPD disrupts the MED13/MED13L-Fbw7 interaction. Further, functional assays found that (1) Fbw7 loss increased endogenous MED13/13L protein levels, (2) Fbw7 was able to ubiquitylate MED13/13L in vitro, and (3) overexpression of Fbw7 decreased the half-life of MED13/13L. These results were again dependent upon an intact CPD. Together these data demonstrate that MED13 and MED13L are Fbw7 substrates. 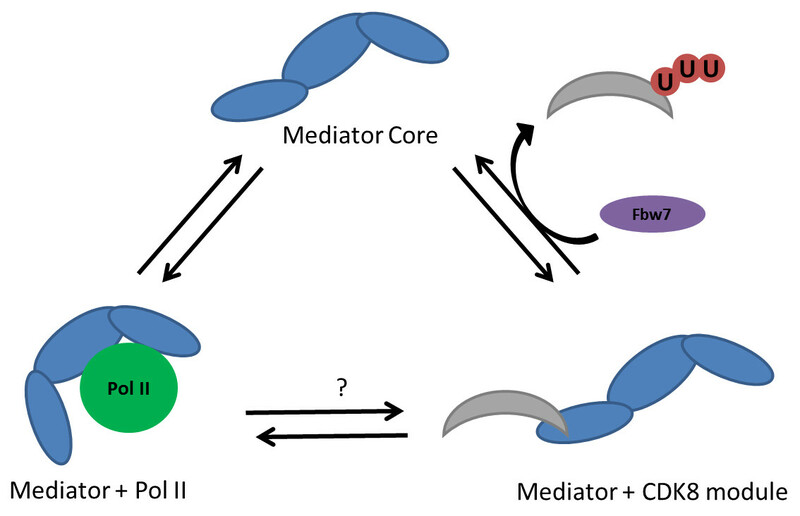 MED13 physically links the CDK8 module with the Mediator core; suggesting that Fbw7 targeted degradation of MED13 may regulate Mediator interactions with the CDK8 module. To test this hypothesis, the team used shRNA to knockdown Fbw7. This silencing led to a 2-fold increase in endogenous Mediator core-CDK8 complexes. The authors then confirmed that Fbw7, but not a substrate binding mutant, ubiquitylated Mediator bound MED13/MED13L, suggesting that proteasomal degradation of MED13/MED13L, targeted via Fbw7, is one mechanism regulating CDK8 module binding to the Mediator core. This study has identified the first known regulator of Mediator-CDK8 interaction and these data significantly expand the scope of Fbw7 as a regulator of general transcription. Davis MA, Larimore EA, Fissel BM, Swanger J, Taatjes DJ, Clurman BE. 2013. The SCF-Fbw7 ubiquitin ligase degrades MED13 and MED13L and regulates CDK8 module association with Mediator. Genes & Development. Epub ahead of print, doi: 10.1101/gad.207720.112.